Humans were created with free will to serve and obey God. Last Day- The world will be destroyed and Allah will raise people from the dead to be judged. It is described as those being judged must pass over Hell on a bridge, and the ones that fall were weighted by their bad deeds and remain in hell forever. The only exceptions are if they are a warrior and died fighting in the name of God, then they are ushered immediately to God's presence. There are two branches of Islam: Sunni (orthodox) and Shiite (sectarian). 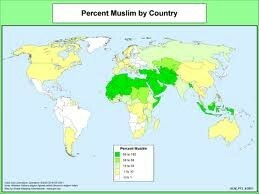 83% of Muslims are Sunni, which is the more popular branch in the Middle East and Asia. 16% of Muslims are Shiites, who make up 90% of Iran, but also in Pakistan, Iraq, Turkey, Azerbaijan, Afghanistan, and Yemen. 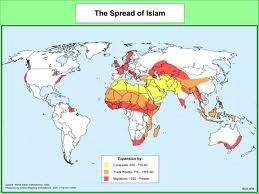 Muhammad's successors organized the adherents into armies that went into Asia, Asia, and Europe. Before a century had gone by after Muhammad's death, the armies conquered, the Persian Empire, Palestine, and a lot of India. This caused many of them to convert to Islam. They captured part of Western Europe (mainly present-day Spain) and Southeastern Europe and Turkey. However within the same century, Christianity regained control of Western Europe. Since it is a universalizing religion, there were missionaries that spread Islam through relocation diffusion in Sub-Saharan Africa and Southeast Asia. Indonesia, the 4th most populous country in the world, is predominantly Muslim since the 13th century, when Arab traders brought the religion with them. The holiest city in the religion of Islam is Makkah (Mecca), because it is where the prophet Muhammad was born. In Makkah, there is a structure in the shape of a cube covered in silk, called the al-Ka'ba. Muslims believe it was built by Abraham and Ishmael, and that there is a black stone inside that Gabriel gave Abraham to show unity between Ishmael and the Muslims. When Muhammad defeated the local people, he cleared the Ka'ba of idols and rededicated it to the Muslims' god: Allah. It is required in the Islamic religion to take pilgrimage to Makkah if you are in good health. Also in Islam is the al-Haram mosque, because it contains the well of Zamzam, which is thought to have water from the same place where Ishmael and Hagar wandered in the desert after being exiled from Canaan. Another important city is Madinah (Medina), because Muslims believe it is where Muhammad gained the support of the people, and became the chief administrator of the city. It is also where his tomb is located. Islam is mainly practiced in Sub-Saharan Africa and the Middle East, as well as in Indonesia and 40% of Southeast Asia and 29% of South Asia. Prophet Muhammad: Last prophet of the Islam religion who was taught the message of the Quran by God. Elijah Muhammad: Black muslim who led in Detroit for over 40 years who called himself "the messenger of Allah." Malcom X: A black muslim minister with tension with Elijah Muhammad, who divided the sect of Islam Nation around 1960. After pilgrimage to Mecca in 1963, he was converted to Orthodox Islam and created the "Organization of Afro-American Unity." 1.Shahadah (declaration of faith)—to bear witness or testify that there is no god except one God (Allah) and Muhammad is His prophet or messenger. 2.Salat (ritual prayer)—the five daily prayers are performed at dawn, noon, mid-afternoon, sunset and night. The prayers are offered in Arabic language and facing the direction of Mecca. 3.Zakah (alms tax) –Giving 2.5% of one's wealth to the poor and needy. 4.Sawm (fasting)—Muslims fast during the daylight hours in the ninth month of the Islamic lunar calendar called Ramadan. The purpose is to remind people of the goodness of what they have and to show equality with the poor. Ramadan is a time for study and self-discipline. 5.Hajj (pilgrimage): Muslims believe in making a pilgrimage to Mecca to the Ka'bah at least once in their lifetime. The kA'bah is believed to have been built by Ibrahim (Abraham)and one of his sons. Muhammad restored it to worship Allah. 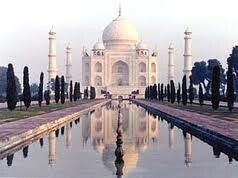 For this reason it is a very sacred place to Muslims. Is the main holy text of the Islam Religion. The Quran deals with a wide range of topics, it focuses primarily on God’s character and relationship with mankind, as well as What God expects out of the followers. 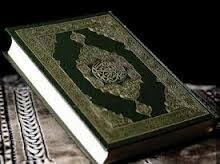 For Muslims, it is a book of guidance that permeates every aspect of life, the text of their faith, and the most important evidence of Muhammad’s role as prophet in his life. It isn't the main text of the Islam religion, but it is important in helping to better understand the Quran. It tells about accounts of the traditions, sayings, actions, and unspoken approvals of Muhammad, recorded by followers after his death. 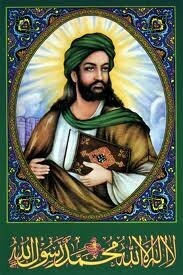 The life of Muhammad is heavily studied, as Muslims view Muhammad as their last living prophet. His teachings serve not only as a model for Muslim behavior but also as an interpretation of the Quran. The word Hadith can refer either to a specific account of the words and deeds of Muhammad, or to the general body of those accounts. 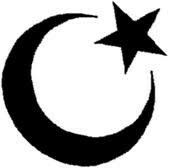 The Crescent Moon and Star is the main symbol that is associate with the Islamic faith. Original, the crescent moon and star came from may origins of polytheistic cultures, but it diffused to the Islamic faith from the Ottoman Empire. Even though a lot of Muslims reject it, it has stuck to their religion like glue. In their faith, the crescent moon and star represents the five pillars of faith because of the five-pointed star, and the crescent moon represents the Holy Month of Ramadan which in the 9th month of the Islamic calendar. 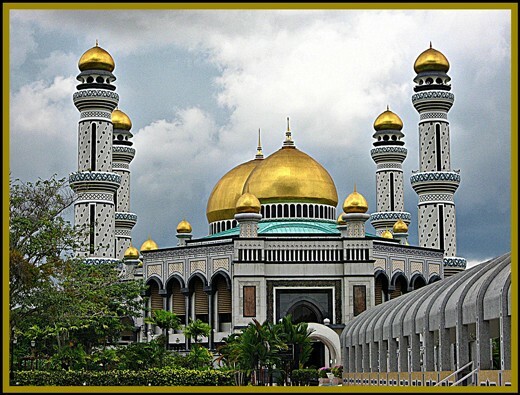 Place of worship for the Islamic faith is mosques. They are very elaborate in structure, or they can be relatively small and modest in shape. -Sahn: A courtyard, with a fountains of water inside the courtyard to symbolize purity and where worshippers can bathe before entering the mosque. sits and looks over the mosque. The minaret is above the sahn or courtyard. -Mihrab: An empty arch that shows the position of Makkah. -Minbar: Place where prayer leader gives the sermon and leads prayers. -Zulla: Prayer hall off the sahn. The effects on family structure are very cut and dry. The Islamic faith says the the family unit is the building block of the Muslim society. Families being together through the good and the bad always lifting each other up when they are in distress is what is highly encouraged by the Muslim faith. More people adopted the faith or took this lesson from the faith, then we would have better families. Better families lead to better kid, and since the kids are the future, then that mean that it would all that brighter. The social effect of Muslim faith include making people better by submitting to Allah (God), and doing good deeds. As the religion has gained more followers, it had effect the social world be more people doing what is right which inturn gives us a better tomorrow. But some people have taken the words of the Quran in a bad way, and some major contributors to this are Osama Bin Laden and the Al Qaeda. They think that the Americans have stomped on the beliefs of the Muslim faith, and they have tried again and again to get back at the Americans. This show how religion and be deadly in the hands of some men. 3) Changes how powers in a culture is assigned. For the Youtube video, watch until 2:23. How does the Islamic religion affect the culture of its adherants? "The Quran (Koran) - Sacred Texts of Islam." Islam Sacred Texts. Faithology, n.d. Web. 06 Dec. 2012. <http://www.faithology.com/texts/islam>. "URI Kids :: World Religions." URI Kids :: World Religions. URI Kids, 2002. Web. 06 Dec. 2012. <http://www.uri.org/kids/world_isla_basi.htm>. "The Crescent Moon." About.com Islam. About, n.d. Web. 07 Dec. 2012. Rubenstein, James M.. "Chapter 6: Religion." The cultural landscape: an introduction to human geography. 5th ed. Upper Saddle, River, NJ: Prentice Hall, 1996. 188, 189, 198, 202. Print. TheWhiteR0ses. "Three Things About Islam." YouTube. YouTube, 16 July 2010. Web. 08 Dec. 2012. <http://www.youtube.com/watch?v=Ib9rofXQl6w>.